Looking for whistleblowing advice? Whistleblowing procedure? Processes whistle blowers should take to report malpractice to WAEC? Below is the official guide for you. Several students had worked so hard for the best grades but to their surprise, the very lazy ones made better grades. This is a dilemma being caused by malpractice and cheating of all kinds. More disappointingly, schools who are supposed to check anomalies of this nature have been found to be the master minders behind the scene. This is why some people have to find resources on how to report schools taking credits for great results even with malpractice. WAEC is one of such well-known SSCE exams that has seeing a series of malpractices. The body in charge had given whistleblowers the authority and guide to reporting schools to them. 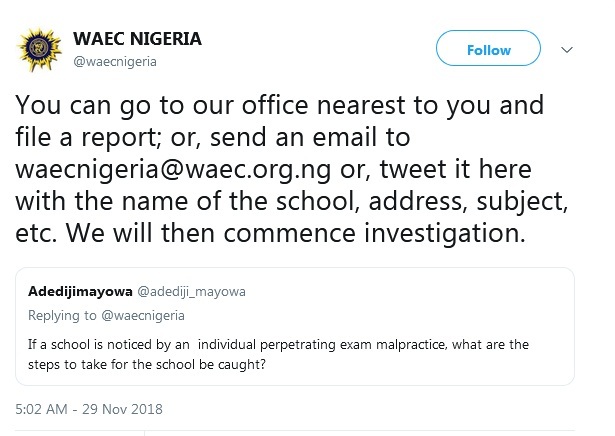 What is Malpractice According to WAEC? All other acts that contravene the rules governing the conduct of the examination. Below are the steps to take if you find a neighbouring school helping students in exams. Then, the body will look into things. ICPC is the federal government owned agency for all acts of indiscipline in the public and private offices. You can report to them by filling the petition form. Then, what for the body to take actions. Want to Recall/Remark WAEC Scripts? Here is What You Must Know?